Gay tours in St. Petersburg Russia. St. Isaac's Cathedral. The Cathedral was named after St. Isaac, because Peter the Great’s birthday fell on the feast day of the legendary Byzantine monk Isaac of Dalmatia, who was canonized by the Russian Orthodox church in the 15th century. St. Isaac’s lived in the 4th century AD, he was persecuted by the Roman Emperor Valens. Peter had him for his patron saint. St. Isaac’s Cathedral is considered to be one of the most richly decorated cathedrals in the world, with its numerous paintings, mosaics, sculptures. The interior is decorated with malachite, lapis lazuli, porphiry and other costly materials. 382 sculptures, paintings and mosaics executed by the best Russian masters of the 19th century. 30 kg of pure gold and 43 different kinds of minerals were used for its interior decoration. 23 best Russian artists were invited to paint the walls, vaults, and pylons. There are canvases on the pylons and oil painting on dry plaster on the walls, vaults and the dome. St. Isaac’s was the main Russian Orthodox church, now it is mostly used as a museum, although they have services on Russian Orthodox Christmas (January 7th) and Easter. 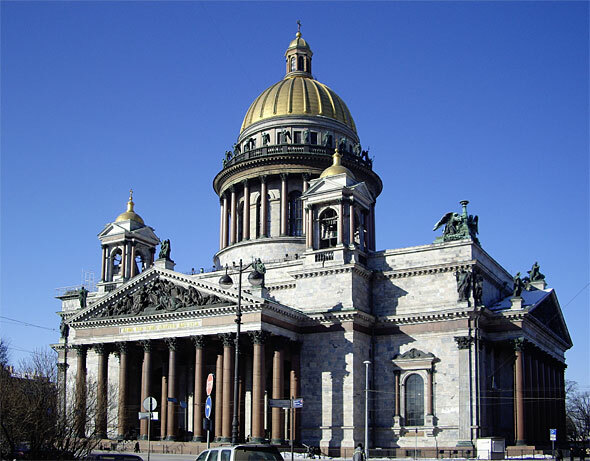 There are regualar services every morning on Saturdays and Sundays in St. Alexander Nevsky Chapel in this Cathedral.